Designed to deep clean pores and exfoliate skin for the freshest cleanest skin possible. Invigorating jojoba bead exfoliation opens follicles and removes cellular debris whilst glycolic acid loosens the glue-like substance that holds layers of dead skin cells together revealing a brighter smoother skin. Aqua, Glycolic Acid, Nylon 6, Ammonium Lauryl Sulfate, Sodium Hydroxide, Jojoba Beads, Caprylic/Capric Triglycerides, Paraffin Oil, Magnesium Aluminium Silicate, Glyceryl Stearate, D-Panthenol, Cetyl Alcohol, PEG-100 Stearate, Stearyl Alcohol, Xanthan Gum, Tea Tree Oil, Sodium, Hydroxymethyl Glycinate, Disodium EDTA. Love love love skinstitut products. As an extremely busy working 45 year old mother i love how easy these products are to use. I wash my face at 4am and out the door looking and feeling great all day. Its that simple the whole family use them (even the males). I love how the product is the main ingredient not the packaging. Well done for finally being able to get them online. I have been using Skinstitut products for a couple of years, now. This particular product does amazing things! 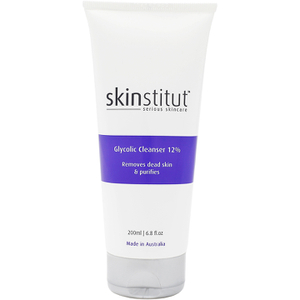 Used twice a week, it exfoliates my skin and continues to gradual fade my brown spots ( too much sun baking!) Love this product! I wish I could give it 10 stars! I was recommended this product by a friend and I'm so glad she told me about it. I've always had bumpy red skin on my arms and from the moment I started using this product, I saw an instant improvement in my skin. It's been several weeks now and I couldn't recommend enough! I have been using this amazing scrub for quite a while. It is does ALL it promises to do—- and more. I love it and will continue to use it. I have been using this scrub for 3 years and I love it. Great value for money and noticed results immediately - can be used daily unless you have super sensitive skin. I have quite sensitive skin so I only use this product once a week or whenever I feel my skin needs a good clean. Doesn’t irritate my skin. I love the way this product provides a gentle yet effective exfoliation. My skin always feels so smooth and soft after using this product. Only a small amount of product is required so it lasts for a long time. This product does what it says, but a word of caution, dont scrub too harshly with it as it can be very hard on the skin. Love this scrub I use it every day and my skin has always responded well to it.